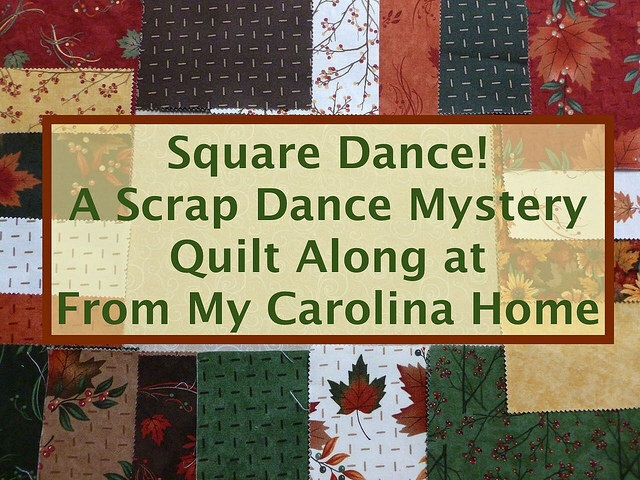 Carole (From My Carolina Home) is hosting another Quilt a Long (QAL), called Square Dance! 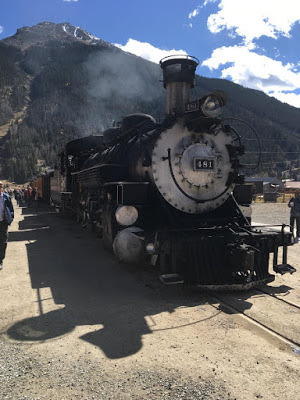 She has hosted several mystery QALs, and I participated in 2017 to make American Two Step. The clues are published once a month, so the pace is somewhat relaxed and manageable. 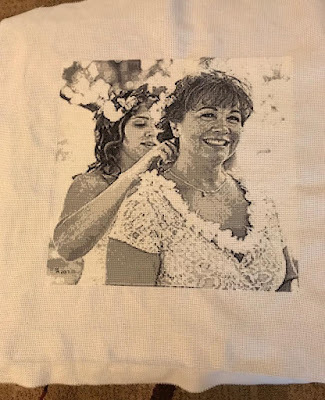 Carole's clues are well written and easy to follow. I decided to make Square Dance with the abundance of fabric I purchased for Tavern Blues. 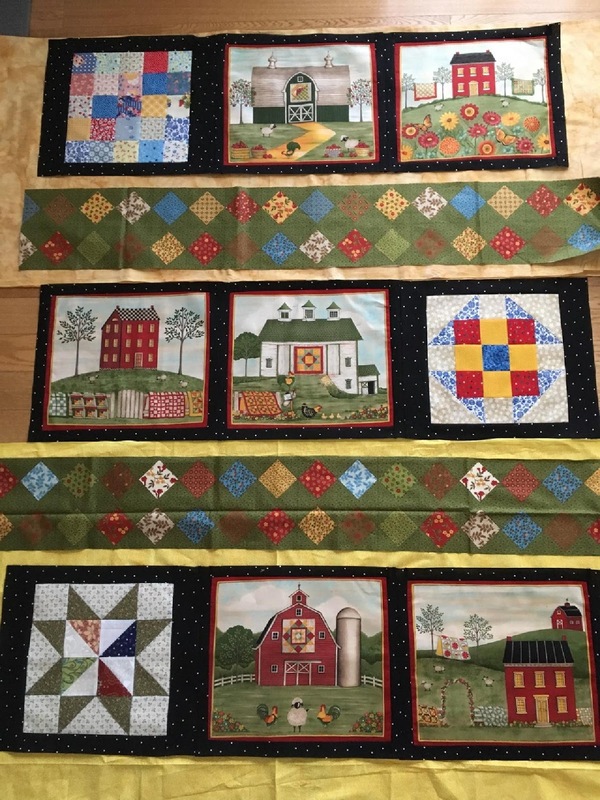 Over the weekend, I pulled the fabrics from my stash and cut the required pieces. Want to join me in the Square Dance QAL? Marilyn and I decided to work on some UFOs in 2018, so we each made a list and decided to work on a specific number each month. 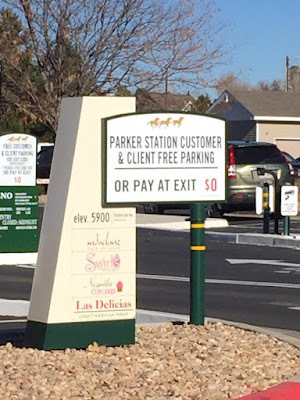 Number two was selected for January. Home Sweet Home started with a panel of three houses and three barns that I purchased over five years ago in Laramie, WY. 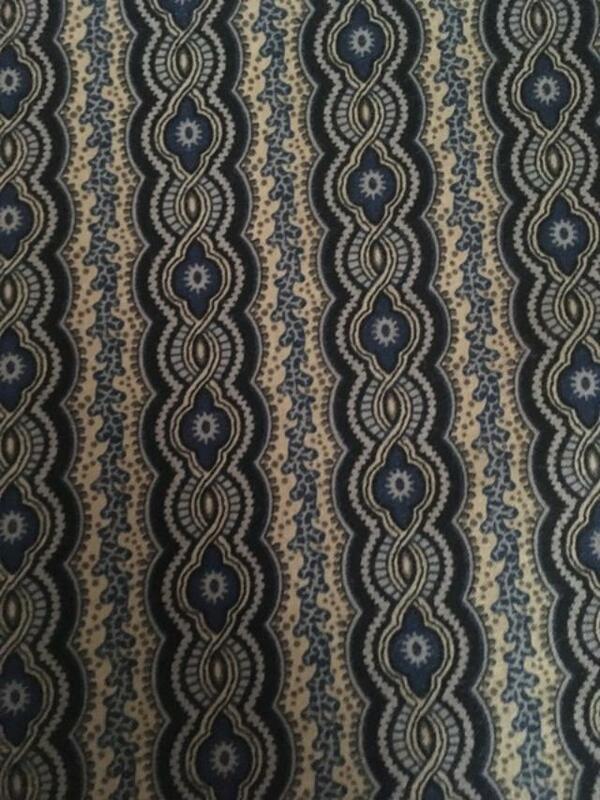 The "cheater" fabric was purchased online from the same shop a year or two later. 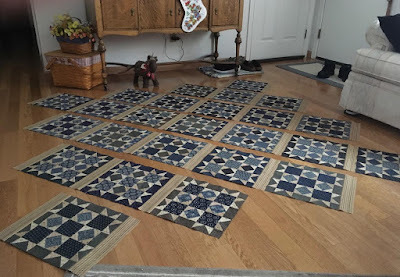 The three additional blocks were made from my scrap bins. 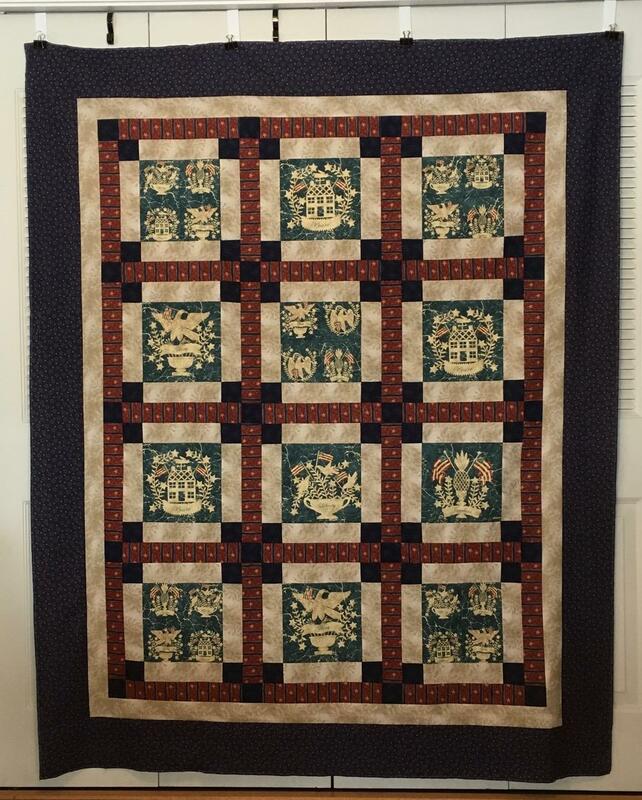 A length of green/red yardage in my stash will make a nice back for this quilt. Home Sweet Home can be finally be crossed off of the UFO list. Removable stitch markers are very helpful. 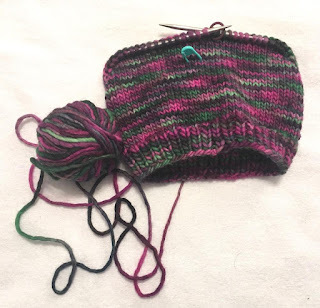 I use them in many ways: to indicate the right side of my knitting, to mark my progress in the knitting session, to show measurements (the green marker on this baby hat is at the 3 inch mark - I begin decreases at 4 inches), and to hold a dropped stitch until it can be repaired. Over the years, I've used various stitch markers, but the removable ones are my favorite because they are so versatile. UFO progress has been slow the last week, but I did manage to get the rows sewn together and the first outer border attached. 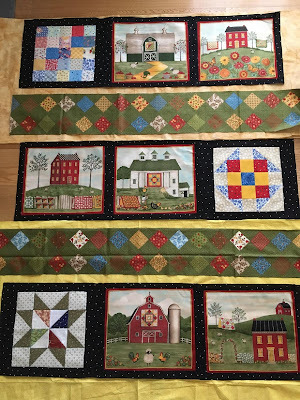 I debated about what to do between the rows: I thought about using either bright yellow or muted yellow between the green cheater cloth. Marilyn and Brenda thought the muted yellow would work the best, and I agreed; however, I decided to move the muted yellow to a frame around the rows rather than in-between the rows. 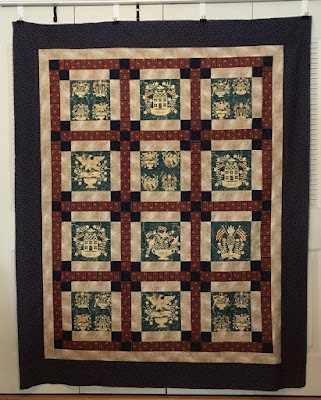 The top has been on my design floor for a week, and I've decided to add another black border rather than introduce another color. The final border will be the green cheater cloth. Hopefully, this UFO will be completed by the end of January. Even though I've been busy with various activities, I've managed to sneak in some knitting in the evenings. 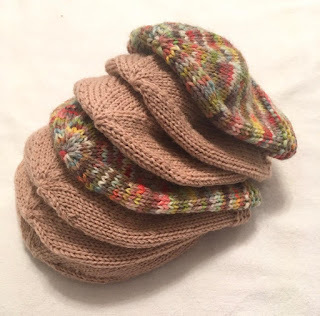 I can usually knit one baby hat in an evening, so this stack of hats represents a week of knitting. The tan hats were knit on size 5 needles with double strands of sock yarn and 70 to 80 stitches, depending on the amount of yarn available. The multicolored yarn was the small skein I dyed at the Guild Spring Retreat in May. This stack of baby/toddler hats will be sent to the Pine Ridge group. The Christmas decorations have been returned to storage, but the Snow Pals are still hanging by my front door. 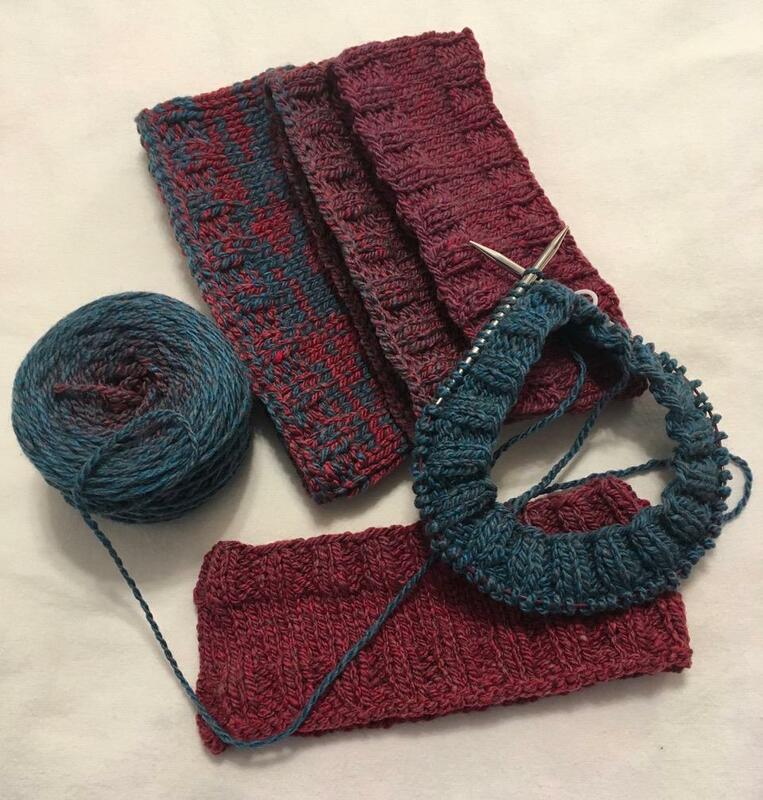 In December, I replaced their faded and limp scarves with some colorful scraps. I can't remember when they were purchased, but it's probably been about ten years. Two different styles of fence pickets form the snowmen. 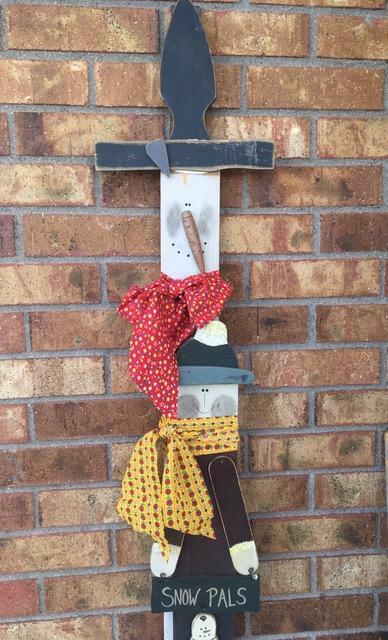 These two pals make me smile and will stay by the door until the snow in the yard is melted. I love buttons and even collect them, but I cannot imagine sewing this many buttons on one garment. The beauty of art is that the unimaginable becomes tangible. I've been cleaning, decluttering, and downsizing for about three weeks, and gradually I'm making progress. 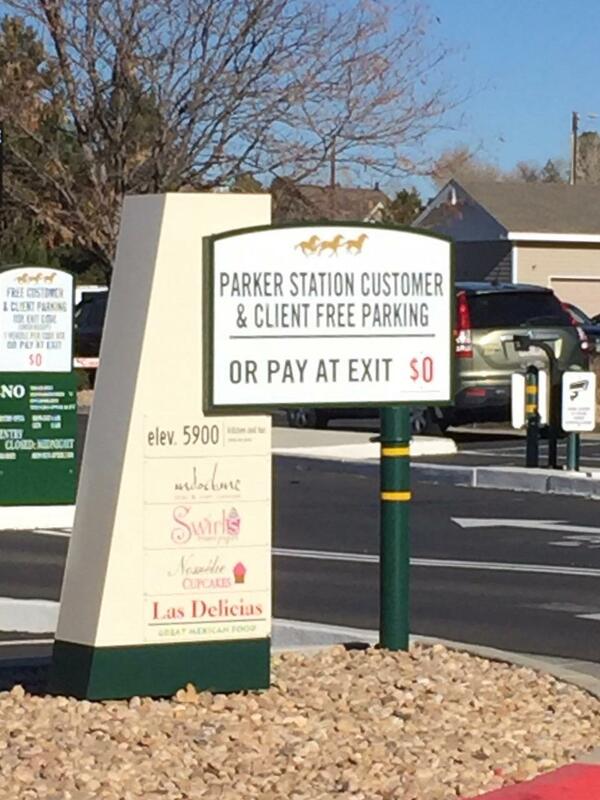 Unfortunately, I didn't take a "before" photo of this area, but it was a mess. The bottom shelf housed a lot of vinyl records; the middle shelf, a record player. I don't know about you, but I haven't played a record in years. It was time to let go of those items and allow them to find new homes. 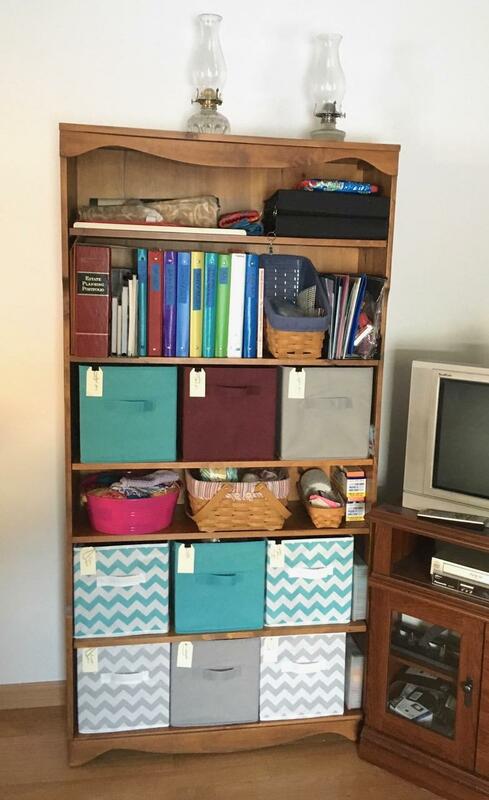 Once the unit was bare, I moved the shelves to accommodate the fabric cubbies. The cubbies contain various types of yarn - not all of my yarn stash, but a good share of it. The yarn is contained, can easily be accessed, and is protected from sunlight and dust. See that shelf of notebooks? They contain various knitting patterns. I was ruthless in cleaning the notebooks, too. Patterns that I knew would never be knit were pulled and tossed in the recycle bin. The top shelf is the home for all of my knitting needles, crochet hooks, and sock blockers. The center shelf contains cotton yarn for dishcloths and cards for making pattern flip books. The hurricane lamps on top of the shelves are used when the electricity goes out. 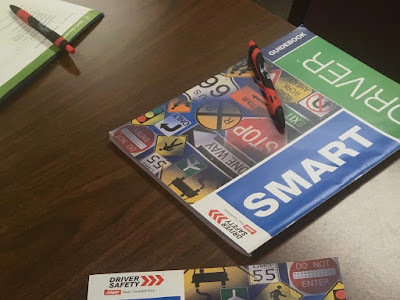 They have come in handy several times in recent years. Having a specific place to store these items makes me happy. Are your crafting supplies all in one area? 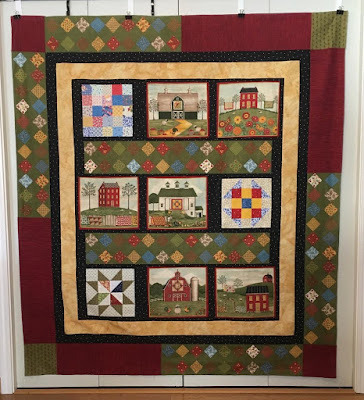 Friday, Sheri and I went to shopping for bargains at Sheep Camp Quilt Supply. 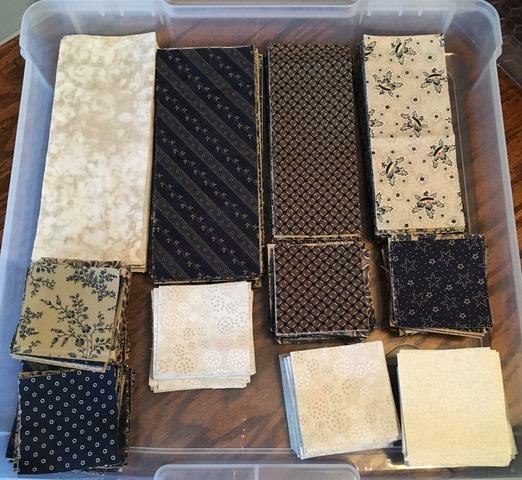 The shop was closed last week for inventory and informed customers that the Clearance Room was well stocked with fabric priced in the $4-6 range. 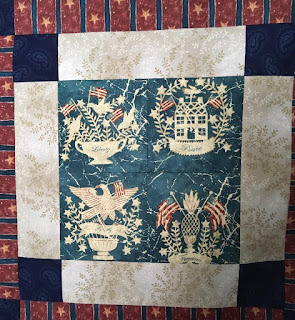 I came away with more fabric than I intended to purchase, but I found some great yardage for Quilt of Valor backings. The five bottom lengths of fabric in the photo are 5+ yards each and will create backings for close to seven quilts. 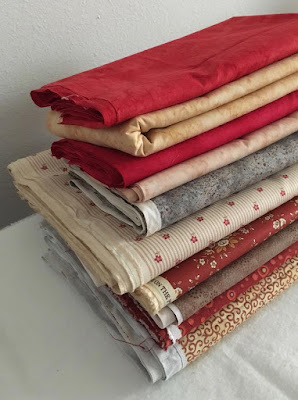 All of the fabric I selected was $4 a yard, a great deal: quilting fabric normally sells for $11-13 a yard. 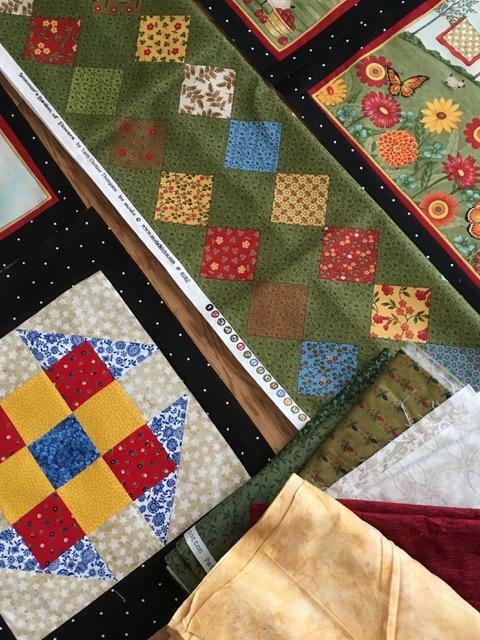 The shop was busy on Friday, and many quilters were enhancing their stash and saving a lot of money. 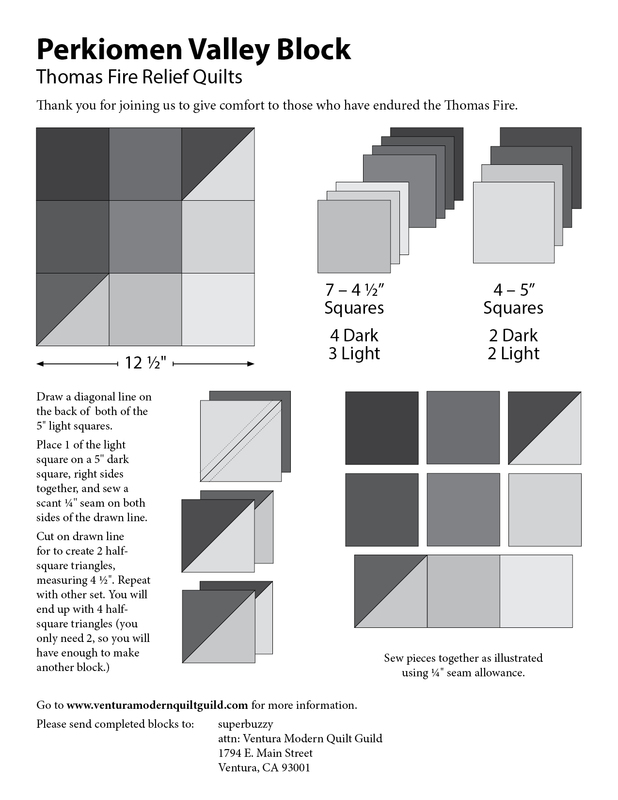 Do you stock up on supplies when you find a good deal? 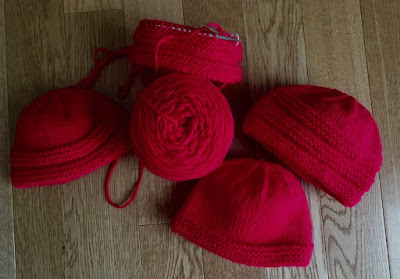 A local yarn shop (Pingora Yarns) is collecting red baby hats through January for the American Heart Association project, Little Hats Big Hearts. The hats will be distributed at the two local hospitals for babies born in February. I've finished five hats and have a sixth one on the needles. I may be able to knit a seventh as well. 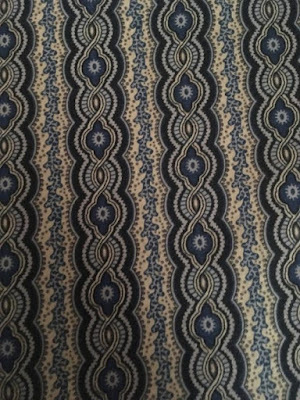 Note: as shown in the photo, the pattern has garter ridge bands. I knit two hats with one garter ridge, two hats with two garter ridge bands, and two hats with three garter ridge bands. 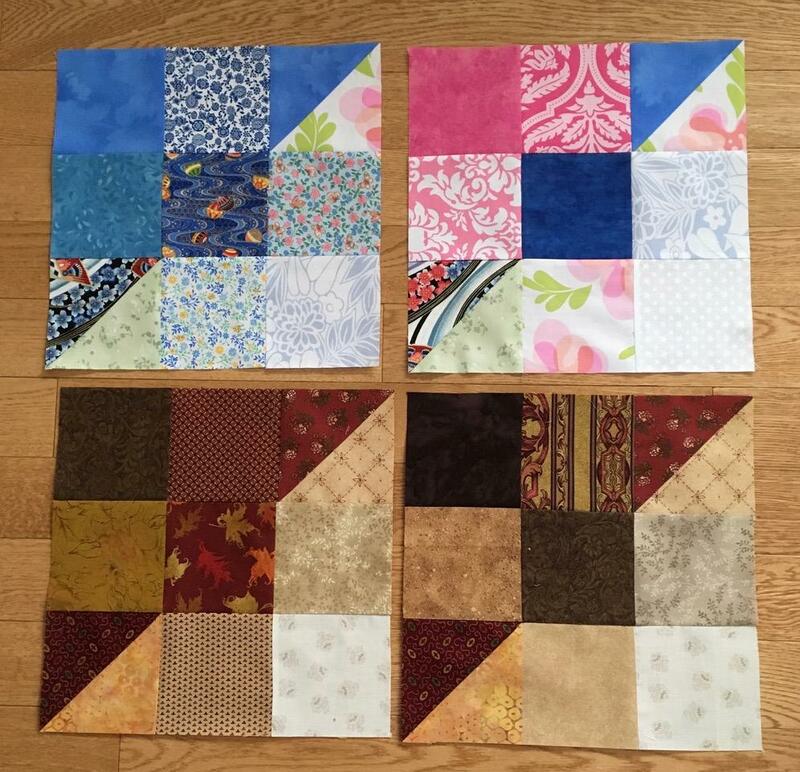 These four blocks are on their way to Carole (From My Carolina Home) who plans to make some quilts for those who've suffered from the Thomas Fire in California. 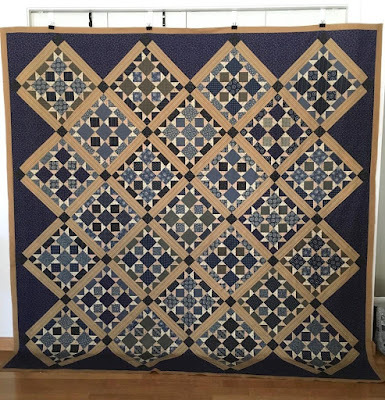 The blocks are also being collected by the Ventura Modern Quilt Guild in California: here's the pattern link and mailing address is listed at the bottom of the pattern page. Update January 13,2018, read this post on Carole's blog about all the blocks she's received. 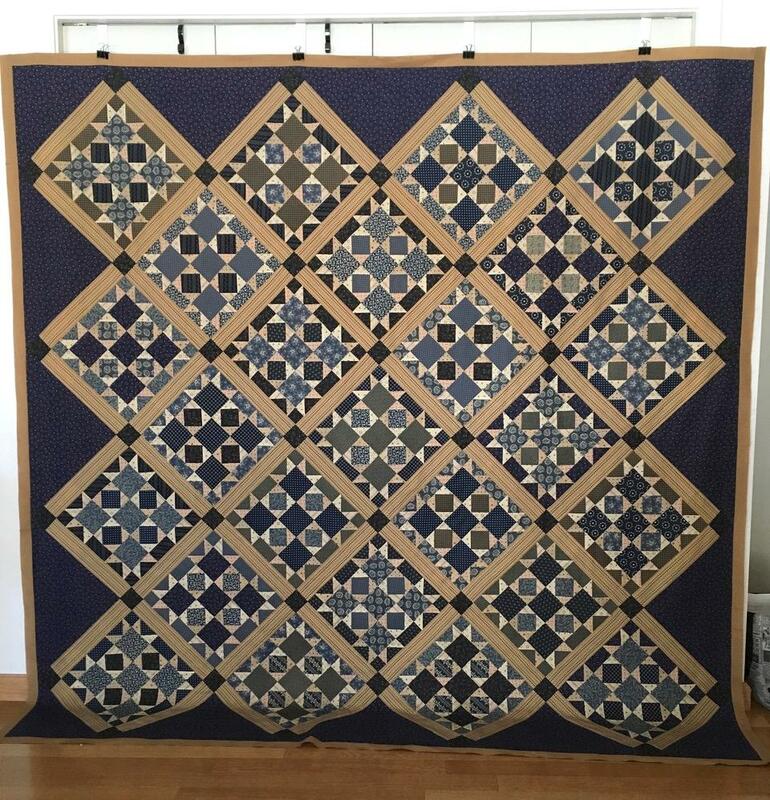 The need for quilts is great, so I hope you can help by sending a few blocks to the Ventura Guild. 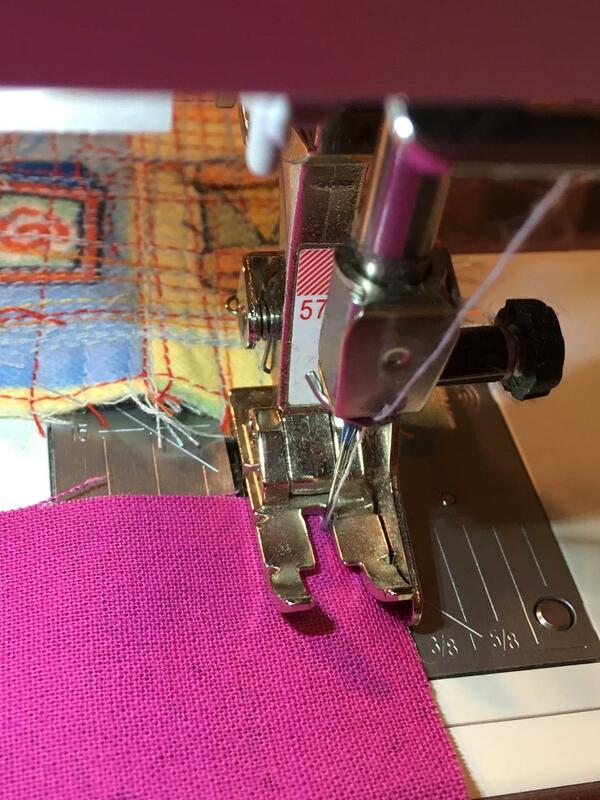 Sewing machines are sold with several standard presser feet, but specialized feet can also be purchased for many brands of machines. I purchased a Quarter-Inch foot with a seam guide soon after I obtained my machine. 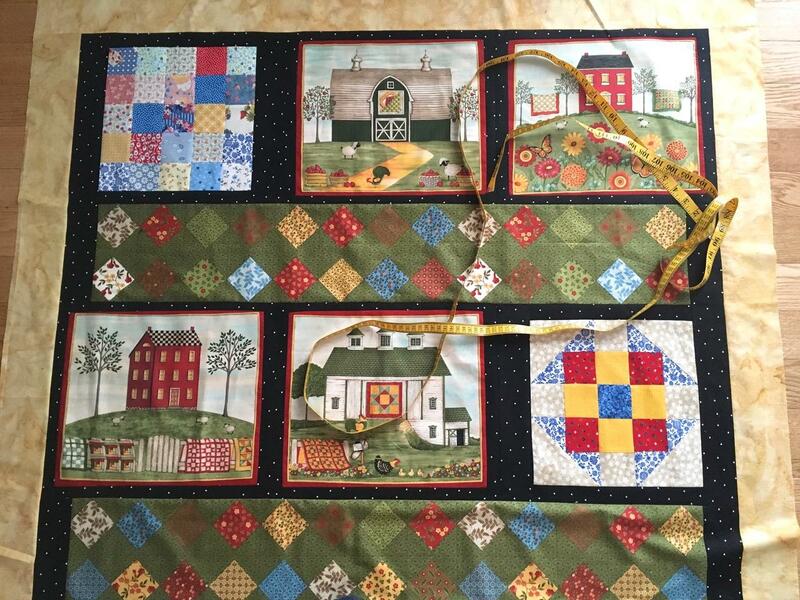 The foot allows me to have consistent quarter-inch seams for quilting. I'd guess that nearly 90% of my sewing is done with this presser foot. It all started with a photograph taken before a wedding on a hot and humid day in Oshkosh, NE. 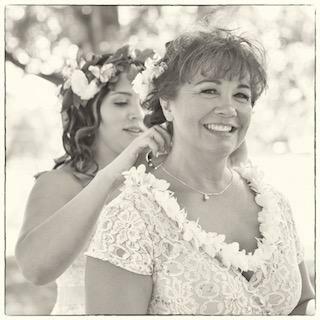 A photo of a mother receiving a necklace from her daughter, the bride. 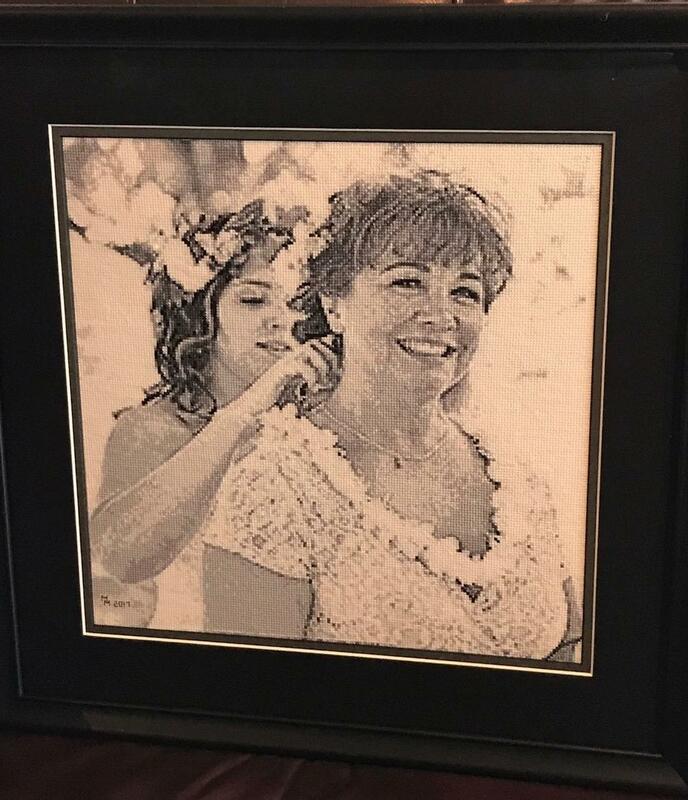 The photo was lovingly transformed into a work of art by the bride's grandmother one stitch at a time. 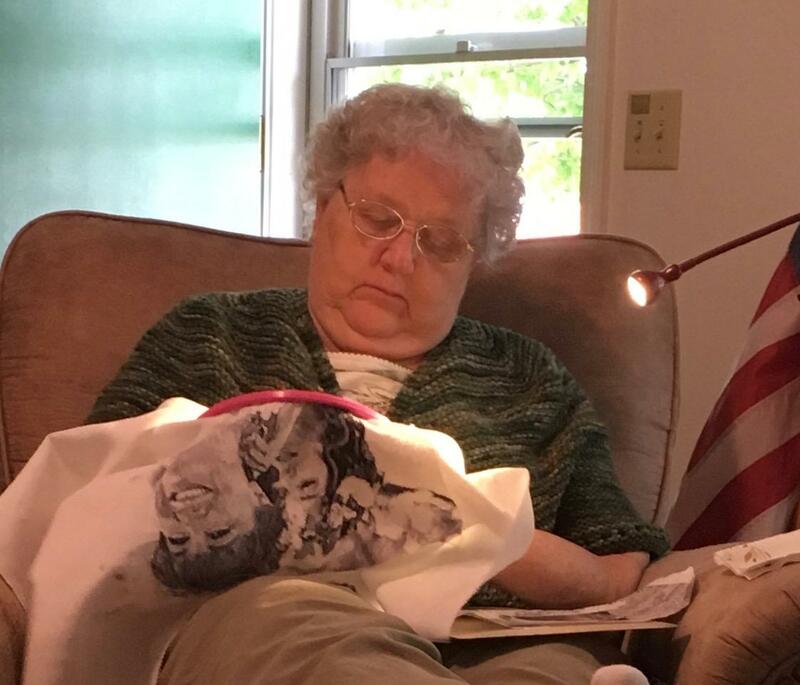 I snapped the photo of Marilyn working on the project when she came to help me after my knee surgery. 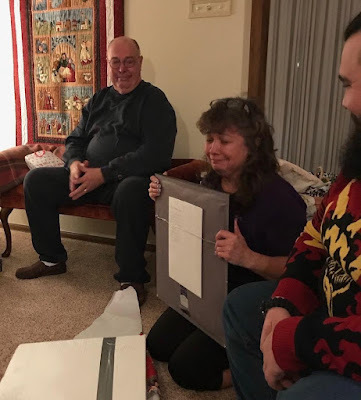 It was hard to wait until after Christmas to post about Marilyn's special gift. I think she did a beautiful job. Maria struggled with her emotions when she opened the gift. Note - the patten is attached to the back of the framed piece. Marilyn has stitched other photographs here and here. 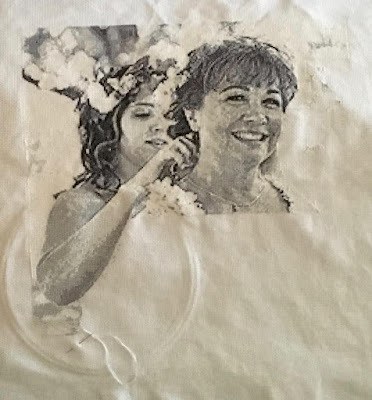 Marilyn stitched a photo of Stephanie and Justin on their wedding day but for some reason I didn't prepare a post about it.